Which one of these is the surest way to scare away a potential customer? Well, you might have guessed. It’s all of the above. There’s no worse way to kill interest in your brand than making prospects wait around when they need to have an answer ASAP. (Or worse, have them head to a competitor). Enter the latest solution on the block: Live chat. Did you know that 42% of consumers say that they prefer live chat functions because they don’t have to wait? But far from merely being a customer service channel, lately B2B companies are realizing that it can be used as a powerful tool for lead generation, and thus significantly impact sales. However, many sales leaders believe that since live chat lives on a website, its scope is limited to customer support, and it sits under the remit of the marketing department rather than sales. But why should sales leaders seriously start backing sales chat? And, how exactly can it help with boosting sales? #1: Capture sales qualified leads, quick! Many sales leaders underestimate how well live chat can be used as a sales tool to generate leads. Let’s go through some key ways using live chat on your company website can help to increase sales qualified leads. In a time where people are used to getting information quickly, they’ve come to expect the same in their online interactions with companies. The power of live chat lies in its power to provide solutions in real-time as your visitor browses your site. What’s more, you’re able to provide a personalized, immediate response based on your interaction with them. The fact that you can respond to prospects faster means that you are much more likely to hold their interest. And the stats support this finding. The 2017 Lead Response survey by Drift (covering 433 companies) found that keeping your customer waiting for more than 5 minutes led to a 10 times decrease in your odds of making contact with a lead. 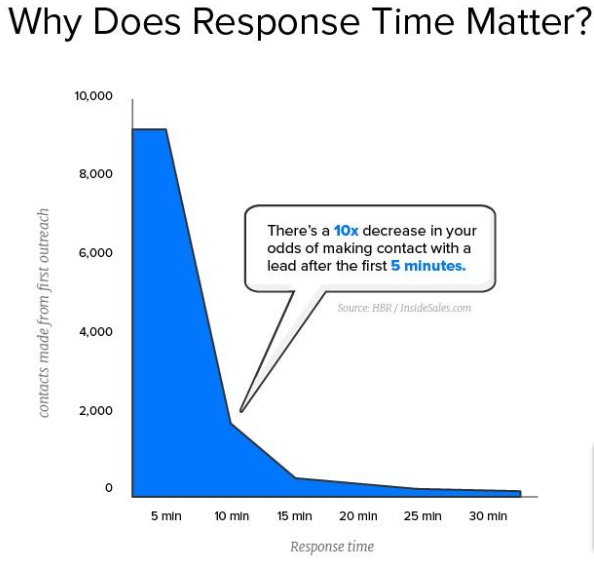 In addition, there was a 400% decrease in the odds of qualifying a lead when the time rose from 5 minutes to 10 minutes. As you may know, the B2B sales cycle is a non-linear process. Anything can happen from the point a lead expresses interest to the point of sale. A company can need buy-ins from multiple stakeholders, they may be restricted by budget or lack viable resources to make a particular solution work for them. Any sales leader that has used live chat can vouch for the platform’s superiority when it comes to setting up quick demos or appointments online with a customer. In fact, you can do this alongside resolving queries and sharing relevant content. It has the power to open up companies to a six figure deal in just 15 minutes after chatting with a prospect and setting up an instant call via a chatbot. Amazing, right? Customer needs are changing and so is B2B buying behaviour. Nobody wants to be forced to listen to a stuffy presentation or be subject to a pushy sales call. Whatever stage they’re at in the buying process, visitors, leads or prospects need to be nurtured with timely, educational and relevant content. Sales chat can reach out proactively to web visitors to ask if they’d like help or guidance through the sales process. Many chat softwares offer the functionality of having proactive chat boxes pop-up on a particular page (say, product, pricing or contact us) or after the user has spent X amount of time on the site. During the lead nurturing process and/or while resolving queries/questions, sales chat reps can subtly dig deeper to uncover more about visitors motivations by asking the right questions. Understanding their needs, drive and buying behaviour is super valuable because it allows sales reps to draw insights and understand their prospect or lead. This means they become better equipped at overcoming objections and offering your product or offering as a direct solution to their pain points. A positive customer experience with your brand has intangible benefits. Apart from creating a good impression, they are more likely to remember your brand when it comes to purchasing, and may even refer you to others in their circle. Live chat is a powerful way to encourage your visitor or lead further down the sales funnel, making them more likely to convert. The best part is you could even use chatbots to engage your leads when you’re not around. Offering 24/7 availability and global service is a huge advantage when it comes to growing your company. You are planning a much-deserved beach holiday to Ibiza, Spain this summer. Your travel plans are slightly complicated because you also want to stop over in Barcelona to visit your aunt for a couple of days. Added to that, the return flights need to be out of Madrid, and you have a few extra members of the family joining you. You log-on to a popular comparison website to look for flight and hotel deals. But, you struggle to find the right flights/accommodation to travel across multiple cities with various passengers. You look for an online chat button to quickly ping somebody for help but don’t find one. So you send an email out to the customer support email with all the details. And you wait. For 1, 2, 3 days and then you get an email asking for a number to have your exact needs discussed on a phone call. By then you’ve already gone ahead with an alternate booking on a competitor site. This is a classic example of a missed sales opportunity. If only there was an option to chat live with a rep, discuss options and then make a booking there and then. In the B2B world, failing to follow-up or delaying a response to qualified lead can result in hundreds, thousands or even millions of dollars in missed opportunities. Needless to say, a poor user experience like this can have a potential customer lose interest in your brand, or have them choose a competitor. Did you know that as many as 44% of online consumers say that the ability to chat with a person live while buying online is an important feature for a website to offer. While it’s a rapidly growing space, B2B companies have been relatively slow to warm to it. According to one study, only 14% of surveyed companies have live chat on their website. This could be due to a lack of knowledge about how to get started and roll it out within organizations. 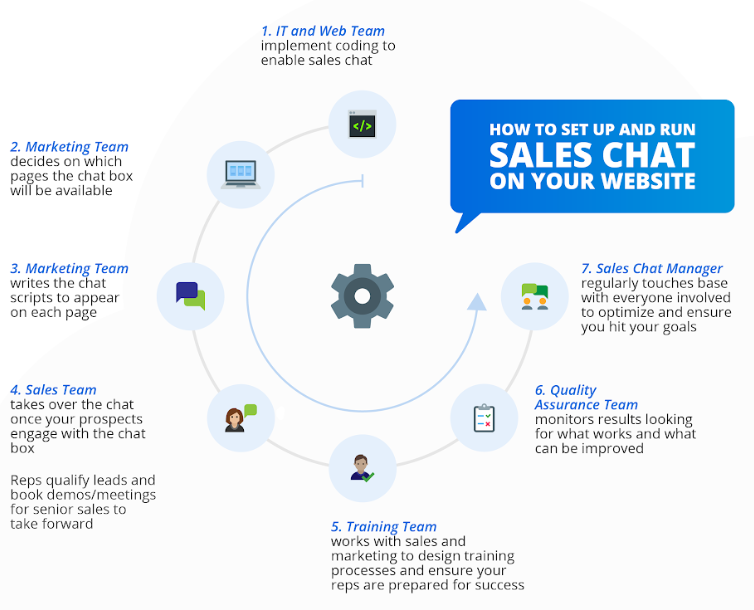 Luckily, setting up and running sales chat on your website is relatively simple (more on that below). If you’re starved for time and resources, consider using a managed service for sales chat to ramp up your business. It’s basically a cloud-based team of Sales Chat Reps, Content Writers, Account Managers and Quality Assurance Analysts who can take on the entire chat sales function for you (for a fraction of the price too). Setting up sales chat is a quick and simple process. If you follow the steps below you’ll be generating sales leads within a day. Whichever team takes full responsibility for the chats is up to you, but one thing is for sure. As long as you have some web traffic to your site, you’ll be booking qualified appointments almost immediately. There aren’t that many tools that generate such a quick ROI from such a simple tool. Would you believe it if I said sales chat can help you grow your pipeline by over $4.5 million? You read that right, and we have proof of this too. You see a visitor is usually more receptive to write or respond to a proactive salesperson via live chat than they are to respond to a call or email. Apart from seeming less intrusive, live chat puts your reps directly in front of leads or customers. This means there are are greater opportunities to pitch solutions or cross-sell and upsell your product or services. Back to the $4.5 million example. Ipswitch, an IT management software developer were losing out on connecting with thousands of visitors (many of whom were qualified leads) to their website everyday. - Proactively pitching to visitors who land on particular web pages such as the product or pricing page. - Using a dedicated sales rep to target Latin American prospects in Spanish. - Responding to technical enquiries and passing them directly to the Ipswitch customer support team. Thousands of Marketing Qualified Leads were generated from sales chat, which led to 84 opportunities added to the pipeline, and over $4.5 million of open opportunities in 2018, of which $1.2 million became closed won deals. If implemented and used effectively, sales chat is a guaranteed way to boost revenue and grow your company. There is an an ever increasing need to cater to highly-informed, tech-savvy consumers by leveraging new platforms that can be effectively used to engage and convert prospects. To keep up with waning attention spans, brands are finding clever ways to cater to the smartphone generation by making online purchasing more fun, innovative and quicker too. From being able to order a pizza by tweeting a pizza emoji, to the rise of conversational marketing that has businesses sign up for a demo in minutes. While all this can seem overwhelming, companies need to evolve and adapt to new technologies that reflect the way customers prefer to buy.